As we begin our tour of the holy places of East and Central India, the first major holy place to see is only a short three-hour ride by train or bus ride south from Delhi. Now that they have built a nice highway through the area, the road is much faster than it used to be. Vraja, which has a perimeter of 168 miles and is composed of many villages and towns, is considered nondifferent from the holy places of Mayapur (Navadvipa), Jagannatha Puri, and Dwaraka. The same spiritual nature is manifest in all of these places. But Vraja is considered the holiest of all holy dhams. In many places in the shastra are descriptions of the glories of Mathura and Vrindavan. The glories of Mathura are elaborately explained in the Varaha Purana, chapters 152 through 180. One verse states: “A moment in Mathura is worth a thousand years spent in Kashi (Varanasi).” And simply by bathing in the Yamuna River in Mathura one can be freed from all sins. Residing here for only a few weeks qualifies one for liberation from material existence. And each step taken in Mathura is equal to visiting a holy place elsewhere. It is explained that those who die here attain Vishnu-loka, the abode of Lord Vishnu in the spiritual sky of Vaikuntha, and do not take birth again. Basically, Vraja is the land of Krishna. If you really want to understand the pastimes of Krishna, you have to know Vraja. And if you want to know the significance of Vraja, you have to understand Krishna’s pastimes. Krishna was born in Mathura 5,000 years ago but lived in Gokula for three years, then moved to Chatikara and Vrindavan for three years, then lived in Nandagram for three years, and from age 10 to 28 He lived in Mathura. After this, He moved to the western coast of India where He lived in Dwaraka for over 96 years. Thus, He stayed in this world for 125 years, but some of His sweetest and most attractive pastimes were performed in Vraja. To fully explain these pastimes and where they took place in this present volume is impossible unless we wanted to greatly extend the length of this book. There are other books that you can acquire that will explain these pastimes much more fully. But there are some significant sites and temples that I’ll try to briefly describe so you can visit and understand their significance. 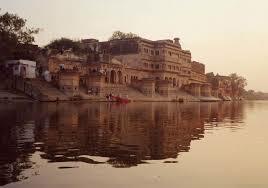 We will start our tour at Mathura since that is usually where we get off the train or bus. Downstream from Vishrama Ghat is Prayaga Ghat where the ancient temple of Veni Madhava is located. It is said that by bathing here one gets the benefit of bathing at the sangam (where the three rivers of the Ganga, Yamuna, and underground Sarasvati meet) in Prayaga (Allahabad). A little farther is Bengali Ghat where Vasudeva is said to have crossed the river when taking baby Krishna in his arms from Kamsa’s prison to Mahavana after His birth. Next, there is Dhruva Ghat where there is a temple on a mound called Dhruva Tila which marks the spot where Dhruva performed austerities to get the darshana of Lord Narayana, as described in Srimad-Bhagavatam. Across the river from Vishrama Ghat, about 200 meters from the river, is the small village of Isapur. Here you will find a temple with an image of Durvasa Muni which marks where the great mystic performed many austerities and meditated during Satya-yuga. During the afternoon when the temples are closed you can visit the Government Archeological Museum. It has a good collection of Hindu, Jain, and Buddhist sculptures and artwork. Mathura was a major Buddhist center with as many as 20 monasteries when the city was visited by Fa Hian around 401 C.E. and Hiuen Tsang in 634. But things drastically changed for Hindus and Buddhists alike when the Muslim invaders, like Mahmud of Ghazni, arrived in 1017. After that Buddhism practically disappeared from Mathura. Another place opened all day is Ranga Bhumi, the area which was the wrestling arena of King Kamsa located across from the Main Post Office. On a hill, Kamsa-tila, is where Krishna killed the demoniac Kamsa, and just beyond it is where Krishna crowned Ugrasena as King of Mathura. A short ride further south is Chinta-garam Ghat. This is indeed a very quiet and lovely spot along the Yamuna. Only a few sages live here with their cows and a small temple with a few deities of Krishna and a Shiva Linga. It is soothing under the tree and sitting in the sand. This is the place where Mother Yasoda visited in order to soothe her mind after being confused by seeing the universe in her son’s mouth. She could not fathom that such a sight could be seen in Krishna, so she had to come here to calm herself. So even today it is a nice and quiet place with the only sound coming from the wind and the birds in the trees. Seven kilometers further south is the Dauji temple. Dauji is the deity of Lord Balarama that was originally installed 5,000 years ago by King Vajranabha, Krishna’s great-grandson. In fact, he established a number of Krishna deities in the area. The present temple was built 200 years ago by Shyama Das of Delhi. Many people also attend this temple to get darshan of the single deity of 6 feet tall Lord Balarama. From the other side of the temple, you can see the deity of Revati, Lord Balarama’s wife. Nearby is the Balabhadra Kund or Kshira (milk) Sagara (sea) where the deity of Lord Balarama had been hidden during the Moghul invasion. Near this kunda is a temple to Harideva and in the bazaar is another temple to Banke Bihari. Back in Mathura, we start toward Vrindavan and soon find the Gita Mandir, a very nice temple built by the Birla family. The temple has a very good standard of worship for the deities of Lakshmi-Narayana, as well as Sita-Rama. The central deity is of Lord Krishna explaining the Bhagavad-gita to Arjuna. In the courtyard is a column called Gita Stambha that has all the Bhagavad-gita verses engraved on it. Twenty minutes away we find the Pagal Baba temple complex. It has residential facilities surrounding the courtyard, and a large temple with many dioramas of the different incarnations of Krishna on the bottom level. As you go to each higher floor there are altars with deities of Lakshmi-Narayana, Sita-Rama, Vamanadeva, etc. On the top floor, you can look out and get a good view of the town of Vrindavan in the distance. Across the road nearby is a path leading to Akrura Ghat, which used to be along the Yamuna River until the river changed its course, as it often does in this area. Akrura Ghat is where Akrura, Krishna’s uncle, got to see Krishna and Balarama as Vishnu and Ananta lying on the surface of the Yamuna. Akrura had stopped there to chant the Gayatri mantra while taking Krishna and Balarama to Mathura. What the vision signified was that Krishna never leaves Vrindavan, He eternally resides there, but Krishna’s expansion as Vishnu was going to Mathura. Now we continue to the holiest town of Vrindavan which has many temples to see. In fact, it is said that there are over 5,000 temples in this town, both large and small. Out of all of these, I will describe the most important. Vrindavan is not a place you go to and expect all its secrets to become easily revealed. It is said that you do not get to Vrindavan simply by purchasing a ticket. Vrindavan is not only a geographical place, but it is a state of spiritual consciousness, without which you will not comprehend the special nature of the place. Thus, as you become qualified through bhakti-yoga, and by receiving the blessings of the resident devotees, Vrindavan will gradually reveal itself to you. I have personally experienced this. Only after staying in Vrindavan for several weeks was I able to find and understand the meaning of certain places and temples that I had been looking for from the time I arrived. Slowly I began to have my own realizations about the spiritual characteristics of this holy town. For me, Vrindavan is my favorite place in all of India. I love to walk around the village visiting the temples and holy places, seeing the beautiful deities, dealing with the friendly residents, and watching the pilgrims who also tour the temples. Of course, this does not mean that you should not be careful as in other places in India. There may still be plenty of ricksha drivers and storekeepers who are too willing to raise the price on their services and merchandise when they see a foreigner. And some tourists are easy prey for such people. But after having done as much traveling as we have throughout the rest of India (unless you have come straight to Vrindavan from Delhi upon your arrival in India), we will find that Vrindavan is a small and very sweet village that is easy to get to know. The spiritual nature of this place can be very apparent if one is able to perceive it, and some people feel it right away. But there can be plenty of things that can hinder your absorption in such spiritual bliss. Things like mosquitoes, noisy monkeys that fight in the night that keep you from sleeping, incredibly hot summers, cold winter nights without central heat, and so on. For the average person, it is not an easy place in which to live. That’s why it is recommended to keep your visits in Vrindavan short so you do not lose respect for the place and consider it an ordinary, mundane town, and, thus, become critical and offensive. Such an attitude makes one lose all ability to enter into even the most basic level of Vrindavan’s spiritual atmosphere. In the proper consciousness, one can perceive that everything about Vrindavan is spiritual. Rupa Goswami explains in his book Sri Upadesamrita that Vridavan is spiritually superior to Mathura because this is where Krishna’s highly esoteric rasa-lila pastimes take place. Rupa Goswami was the top literary disciple of Sri Chaitanya Mahaprabhu and chief of the Goswamis who lived in Vrindavan about 500 years ago. He wrote many books about the art of devotional service to Krishna and restored many of the holy places in Vraja, re-establishing its spiritual importance. The rasa-lila is the pinnacle of transcendental loving exchange between Krishna and His purest devotees, the gopis or cowherd girls, as explained in Srimad-Bhagavatam. The rasa dance is purely spiritual and not easily understood by mundane scholarly interpretations. If one is not a bhakta (devotee engaged in bhakti-yoga), one cannot comprehend such elevated love of God. The rasa dance took place in the forest of Seva Kunj, which used to be a much bigger area than the small enclosed forest it is today. Nonetheless, it is considered the center of Vrindavan and is where, according to shastra or the Vedic literature, the rasa dance takes place every night. In fact, it’s said that Krishna never leaves Vrindavan; the spiritual pastimes are eternal. We will understand this more clearly as we visit a few of the temples and relate the pastimes connected with them. Just one thing about visiting Seva Kunj is to watch out for the monkeys. There is quite a pack that lives there and they can be aggressive in ways such as stealing your glasses, which has happened often, or your camera, shoes, etc. There are a number of important temples in this area. Just north of Seva Kunj is Imli Tala. Here we find a very old tamarind tree that has existed since the days of Krishna in the courtyard of a Radha-Krishna temple that was built by Bhakti Saranga Maharaja. Krishna used to sit under this tree and His body would turn golden from ecstatic separation from His dear most devotee, Srimati Radharani. Five hundred years ago, Sri Chaitanya would sit under the tree and due to His love for Krishna, His golden body would turn blackish. Heading east we visit the Radha-Damodar Mandir. The original deities of Radha-Damodar were installed by Rupa Gosvami in 1542 but were later taken to Jaipur where they are now worshiped. The present deities are considered equal to the original. There is also a stone or shila from Govardhana Hill in the temple that has an actual footprint of Krishna on it. Krishna personally appeared to Sanatana Gosvami to give him the shila. He told Sanatana that because he was having difficulty from old age he should stop his daily circumambulation of Govardhana Hill and simply circumambulate the shila. The footprint became part of the stone when Krishna stood on it and caused the stone to melt from the sweet sound of His flute playing. Now pilgrims circumambulate the temple four times, which is equal to walking once around the 15-mile path of Govardhana Hill. You can ask the pujari (priest) at the temple for Giriraja darshan and for two rupees he will bring the Govardhana shila for you to see. Not far away is the Radha-Shyamasundara temple, which is one of the seven main temples of Vrindavan and has some very beautiful deities. It was established by Shyamananda Prabhu XE “Shyamananda Prabhu” who was a disciple of Sri Chaitanya and a very elevated bhakta. In fact, one time he saw Srimati Radharani. He would regularly clean the little forest area of Nidhibana and happened to find an ankle bell. He thought it must be Radharani’s since he knew Krishna and Radha often spent Their evenings there. When Radharani discovered one of Her ankle bells was missing, she sent Lalita to find it. At Nidhibana Lalita saw Shyamananda Prabhu and asked him if he had found an ankle bell. He said he had and asked if it was hers. Lalita said it belonged to her sister and asked to have it. Shyamananda said he would not give it to her but only to her sister. Lalita insisted that he give it to her, and Shyamananda continued to refuse. So Lalita returned to Radharani and Radha decided to personally go for the ankle bell Herself. Approaching Shyamananda, Radha asked for the ankle bells and he was happy to give it to Her. Radha, being pleased with his service, revealed Her identity to him and by impressing Her ankle bells into his forehead personally gave him a tilaka mark. Later, the other bhaktas criticized him for wearing a new style of tilaka. But that night Srimati Radharani appeared to Jiva Gosvami in a dream and told him that She was the one who gave Shyamananda the tilaka mark. Then all the devotees went to Shyamananda to ask for forgiveness and accepted that he actually saw Srimati Radharani. This is another story signifying that the eternal pastimes of the spiritual realm are continually taking place in Vrindavan. A little walk (half-block) from the Radha-Syamasundara temple is Loi Bazaar, one of the main shopping areas in the village. Here you can find all the necessities for living in Vrindavan. There are shops of all kinds, for clothes, medicines, utensils, food, deities and worship paraphernalia. Walking eastward through the bazaar we next see the Shahji Mandir which was built in 1876 by Shah Kundan Lal of Lucknow. This is an attractive temple that has small Radha-Krishna Deities and shows how Shah Kundan Lal, a rich jeweler, appreciated service to Krishna in Vrindavan. To the left of the temple and down a lane is a small but pleasant Krishna temple of the famous poetess Mirabai. A short walk further down the lane is another of the seven major temples, the Radha-Gokulananda Mandir, founded by Lokanatha Gosvami. On the altar of this medium-sized temple are the Radha-Vinoda deities of Lokanatha Gosvami (though his original deities were moved to Jaipur), along with Radha-Vijaya Govinda of Baladeva Vidyabhushana, Radha-Gokulananda of Vishvanatha Cakravarti Thakura, and a Sri Chaitanya deity that belonged to Narottamadas Thakura. The temple also has a small Govardhana shila that was rubbed smooth by Sri Chaitanya who used to hold it while chanting Krishna’s holy names. The shila had been given to Raghunatha Dasa Gosvami. Across from the temple in the courtyard are the samadhis of Lokanatha Gosvami, Narottamadas Thakura, and Vishvanatha Chakravarti Thakura who were all important Vaishnavas in the Gaudiya line. The Radha-Vamsi Gopala temple is also nearby, further down the street, and is where Srila A. C. Bhaktivedanta Swami Prabhupada lived from 1954 to 1962 and wrote his first commentary on Bhagavad-gita. Following the street, to the Yamuna River, we come to Keshi Ghat where Krishna performed the pastime of killing the Keshi demon. Keshi was a henchman of the demoniac King Kamsa and took the form of a huge horse to terrorize the residents of Vrindavana. Krishna, therefore, killed the demon and then washed in the Yamuna. The Adi Varaha Purana establishes that by taking a holy bath at Keshi Ghat brings the results of bathing at all the holy places, and is worth 1,000 baths in the Ganges. Therefore, Keshi Ghat is one of the holiest ghats in Vrindavan. Not far from Keshi Ghat is Bhramar Ghat where Bilvamangala Thakura, the author of Krishna Karnamrita, performed austerities years ago. Lord Krishna used to appear in Vrindavana just to serve His great devotee Bilvamangala by supplying him with a cup of milk every day. As we head back into the village, not far from the Radharamana temple is the Radha-Gopinath Mandir. It is another of the seven original temples and was founded by Madhava Pandita. The original deities were transferred to Jaipur and similar deities were again installed in this temple. Around the corner is the New Radha-Gopinatha temple with deities of Srimati Radharani, Gopinatha, and Srimati Jahnava. Jahnava was Lord Nityananda’s wife and this deity of her was brought from Jahnava’s native Bengal by a man who said the deity appeared by Divine Will. This was years after she had left this world. Then the deity of Gopinatha appeared to the temple priest in a dream and told him that Jahnava was actually the elevated gopi Anangamanjari and that the deity should be placed on the altar next to His left side. So this is why the deities in this temple are now arranged in this way. Retracing our steps just three shops back, on the left, we can find the Pishima Gaura Nitai temple. This small temple has the deities of Gaura-Nitai which had belonged to Murari Gupta. They are about three feet tall, with eight-inch Radha-Krishna deities and some Govardhan shilas in front. Next is the Radha-Govindaji temple that is another of the seven major temples of Vrindavan. It is across the road and a little further down the street from the Rangaji temple. It was established by Rupa Gosvami where he discovered the Gopala deity. The beautiful temple is made out of red sandstone and was completed in 1590. The temple is now only two stories tall but once reached up to seven stories. The Muslim fanatic Aurangzeb, doing his dirty work once again, dismantled the upper five stories of the temple due to his envy. While his men were destroying the temple, there was a loud thunderous noise that shook the ground. This put fear into the hearts of the men and they immediately stopped and ran away. Due to fear of the Moghuls, before they arrived the devotees moved the original deities to Jaipur where today many pilgrims go to see them. So the temple now has pratibhuh deities, or representative expansions, of the original Radha-Govindaji that are worshiped. The original Govindaji deity is said to have been installed thousands of years ago by Vajranabha. A hundred yards northeast of the Govindaji temple is a mound that has the ruins of the Sakshi Gopala temple. The present Sakshi Gopala temple is just outside of Jagannatha Puri. Sakshi Gopala had been discovered and installed in the temple in Vrindavan but walked over 1000 miles to Vidyanagar to bear witness for one of His devotees. This story is told in our coverage of the Jagannatha Puri temples. Following the road going south and then west from the Radha-Govindaji temple, you can find many more temples and ashramas of Vrindavan. Back at Seva Kunj, we now head west to the Radha-Vallabha Mandir. This is a temple that is the center of the Radha Vallabha sect founded by Sri Hit Hari Vamsa, a disciple of Gopala Bhatta Gosvami who was known for his poetry about Radha and Krishna. After this, we see the Banki Behari Mandir, one of the most popular temples of Vrindavan. Haridas Gosvami found Banki Behari at the bottom of Visakha Kunda in Nidhiban after Haridas had a dream in which the deity told him where to look. When you visit the temple you will see that the curtain in front of the deity is closed for a few seconds every minute. This is because the deity once walked off the altar and out of the temple to follow a great devotee who had come for darshan. Apparently, the devotee and deity gazed at each other too long and the deity became fond of the devotee and later walked off the altar to find him. When the temple priests found the deity of Banki Behari, they placed Him on the altar again but began closing the curtain at short intervals to keep the deity from getting too attached to any of the visiting devotees. This tradition has continued ever since then. Not far away, located down a lane, is the Asta-Sakhi Mandir, a lovely eight-sided, dome-topped temple. This temple offers darshan of not only Radha-Krishna (Radha-Rasabihariji in this case), but also of eight important gopis. They include Rangadevi, Champaklata, Chitra, and Lalita on the left, and Vishakha, Indulekha, Tungavidya, and Sudevi on the right. From this temple, you can easily see the old temple of Radha-Madan Mohan to the west. The Madan Mohan temple, located on a hill near the old river bed of the Yamuna, was established by Sanatana Gosvami. This was one of the first temples erected after Sri Chaitanya’s visit to Vrindavan. The deity is said to have been found on the hill by Sri Advaita who gave the deity to a Mathura priest. The priest treated the deity, like one of his children and when Sanatana Gosvami saw this he criticized the priest for not following the many rules and regulations for deity worship. Then in a dream, Madan Mohan told Sanatana that He had been happy with the priest’s spontaneous love, but now He was no longer happy with all these rules that were supposed to be followed. So Sanatana went to see the priest who then gave the deity to Sanatana. At first, Sanatana used to keep Madan Mohan in a tree because he had nowhere else to keep Him. Then one time the deity asked for some salt with the dried bread that Sanatana offered to Him. Sanatana only said, “I am an old man. What can I do? Please accept it the way it is.” Just then a rich merchant was taking a boat loaded with salt down the Yamuna. By Krishna’s will, the boat became stuck in the shallow river. Madan Mohan changed into a cowherd boy who led the merchant to Sanatana. Sanatana could do nothing to help the merchant, so the merchant prayed to Madan Mohan that if his boat became free he would sell his salt and return to use the money to build a nice temple. After praying, the merchant returned to his boat and found that it was no longer stuck. When the merchant sold the salt, he returned to build the temple. So this is how the temple was erected. Later, this was the deity from which Krishnadas Kaviraja got the inspiration to write the Caitanya-caritamrta. Varaha Ghat is in the area of Raman Reti on the outskirts of the village of Vrindavan. Raman Reti means cooling sands and is where Krishna and Balarama would come and play amongst the large trees, flowers, chirping birds, and peacocks. Raman Reti is where the ISKCON temple of Sri Sri Krishna-Balarama is located along the road called Bhaktivedanta Swami Marg. This has become a very popular temple amongst pilgrims who visit Vrindavan. You will find the most beautiful deities of Krishna and Balarama on the center altar, with Sri Nityananda and Sri Chaitanya on the left altar, and Sri Sri Radha-Syamasundar on the right. The tamal tree in the courtyard is said to be where the tree was under which Srimati Radharani would wait for Krishna to return from herding the cows. The temple was founded by Srila A. C. Bhaktivedanta Swami Prabhupada and his lovely samadhi is in front of the temple where his body was interred. Located along the main road from the Raman Reti area or Krishna Balamara Mandir heading toward the downtown area of Vrindavana is the Vrindavana Research Institute. This place has many old manuscripts and along with original leaves with the handwriting of Sanatana, Rupa, and Jiva Gosvamis. Some of the additional ashramas that you can find in Vrindavana include the Neem Karoli Baba Ashrama, near the main road on the parikrama path. His samadhi shrine, along with temples to Hanuman, Sita-Ram and Durga are here. The Ananda Mayi Ma Ashrama is the ashrama of the renown woman saint, on the main road. And Jagadguru Dham along Raman Reti Road is the ashrama of Swami Prakashananda Sarasvati when he’s not staying in his Austin, Texas ashrama. He also has places in Barshana, near Vrindavana, called Rangeeli Mahal and Vishwa Kalyan Kendra. Today, Vrindavana is gaining in popularity. Construction and development is an ongoing thing. More apartments and temples, and guests houses with temples are always being built. So there are many more temples in Vrindavana that you can easily visit simply by wandering around the town. This is where you cannot easily forget Lord Krishna, and most anything you do will give spiritual progress. But respect for the holy dham must be maintained, or offenses committed here can also bring harsh results. To recognize the spiritual significance of Radha Kund may not be so easy for neophytes. As I said earlier, in order to perceive the spiritual atmosphere in Vrindavan you have to receive the blessings of the resident devotees and become qualified so that Vrindavan reveals itself to you. An example of this was related to me by a friend. When he visited Radha Kund he met an old sadhu, a saintly man who had retired from material life and was now living at Radha Kund. My friend asked the sadhu some questions and at first, the man hesitantly explained that he did not work or attempt to maintain himself. He simply depended on Krishna and chanted the holy names at Radha Kund. How he got his food was that a small boy would come by and give him some food every day. The man explained that as a person becomes more and more spiritual, he will recognize the eternal atmosphere that pervades Vraja, especially at Radha Kund, and he will not feel the need to take so much care of the body. My friend then asked him if he could actually see the spiritual world or if he had ever seen Krishna at this holy place. The old man said he had not seen Krishna, but sometimes he could hear the gopis talking with Krishna or discussing amongst themselves how Krishna looked and what He was doing. My friend then asked the old sadhu how it was possible for him to perceive such things? The man then began talking quite readily and convincingly told my friend that Radha Kund was indeed the spiritual world; you simply had to remove your materialistic vision. Then the old man took my friend’s hand and pushed it flat to the ground on the banks of the Radha Kund and said, “Just touch this land and you can feel the spiritual nature of it.” My friend told me that at that moment a charge went up to his arm from the ground and he could actually feel the difference, that this was indeed a spiritual place. But before my friend got the blessings of this sage, he could not really feel the difference. And that is what is necessary. Until you can actually perceive it, all you can do is to try to understand with your mind and imagine how Krishna performed so many pastimes here, and how this place is spiritual. But the actual realization of such things goes much further than that. It is a matter of re-establishing your spiritual identity and connection with the spiritual realm. It is the reawakening of your spiritual consciousness and actually perceiving the subtle nature of spiritual reality. In the area of Radha Kund as you circumambulate the area, you can find numerous temples and important places. To describe a brief tour around Radha and Shyama Kunds, we first enter the area from the bus stop, and on our way along the road, we come to the Radha-Gokulananda temple, which has the pratibhu or representational deities that belonged to Visvanatha Chakravarti Thakur. Going further along, we next come to the Kundesvara Mahadeva temple and the sacred peepul tree. Mahadeva Shiva is one of the guardians of the holy dham. Then we soon get our first view of Radha Kund, and pay our respects by bowing our heads toward this form of Radharani. Farther down across from the vegetable market is the lane on the left that goes to the Purana Mandir, which has a lovely set of Radha Krishna deities. These were found by Raghunatha dasa Goswami when he was excavating the kunds. Continuing on, we come to the road that leads to the left. This can take us to the Gaudiya Math temple with the beautiful deities of Radha-Kunjabihari. Farther on we can also reach the Shiva Khor or kund, and the Ramesvaram Shiva temple. Going further along the main parikrama road, we next see a circular platform, which is a rasa-sthali where dances are performed at times. There we take a right turn. Going down the path we can find the bhajan kutir of Gopal Bhatta. Around the corner is also Krishna dasa Kaviraja’s bhajan kutir, the small living quarters where he wrote the Caitanya-caritamrta and several other important spiritual books. Then there is Raghunatha dasa’s bhajan kutir and the cremation place of these Swamis used when the Muslims were coming into the area. Rather than taking the chance of having their bodies disturbed in case the Muslims would dig them up, they cremated them instead. On a side road, there is the bhajan kutir of Bhaktivinoda Thakur where he and Bhaktisiddhanta would stay when visiting the area. Farther along the parikrama road we next find Lalita Kund on the left, across from which is Jiva Gosvami’s bhajan kutir. Next, along the road and down a lane on the right toward Shyama Kund there is the place of Madhavendra Puri’s sitting place, and around the curve, we come to Lord Chaitanya’s sitting place. This used to be like a little hut or bhajan kutir, but now they have expanded it and put a roof over it. After that, we continue our walk down the lane and other temples can also be found, such as Asta Sakhi Mandir, Nitai Gauranga Sitanatha Mandir, Manipur Maharaja Mandir, Radha Gopinatha Mandir, a Gaura Nitai Mandir, Radha Govindaji Mandir, and other temples that are located around the kunds. Then we go to the sangam or meeting place of the two kunds where many people take a holy bath or do some special worship or pujas to the kunds, since they are non-different from Radha and Krishna. If it is not crowded and somewhat peaceful, it is also nice to sit and meditate or chant japa for a time, contemplating our good fortune to be here. Then returning to the path and going through some shops we pass a deity of Hanuman and pray that he relieves us of whatever offenses we may have committed while visiting, and then we return to where we started. Next, we see Govardhana Hill which is the hill Krishna lifted with the little finger of His left hand for seven days to shelter the residents of Vraja from the torrential rains that Indra had sent. Indra sent heavy rains when he became angry after seeing the residents of Vraja worshiping Govardhan Hill instead of him, according to the directions of Lord Krishna. Only later did Indra realize his great mistake. The hill is also considered a manifestation of Krishna Himself, just as the hill at Barsana is a manifestation of Brahma, the hill at Nandigram is Shiva, and Charanpari is Sesha. Therefore, many pilgrims circumambulate Govardhana as an act of worship, a route that is about 15 miles long and passes near many other holy spots along the way. I will describe a few of the main places along the route. Usually, devotees start their parikrama or circumambulation of Govardhana near Kusum Sarovara. This is a great swimming spot and where Radharani used to pick flowers before meeting Krishna here. It now has beautiful chatris, or small temple enclosures, at one end, which has beautifully painted ceilings. These have many beautiful illustrations of the pastimes of Radha and Krishna. The story of how these came to be built is quite interesting. When the Moghuls ruled over Delhi, the King of Bharatpur, Suraja Mal, attacked them but lost his life doing so. However, his son, Jawarchar Singh, decided to attack and vowed that if he won, he would return and develop Kusum Sarovara in glorification of Lord Krishna. So he assembled an army and attacked Delhi and defeated the Muslim tyrants. Therefore, he returned and built the temples around Kusum Sarovara with his newly victorious wealth. From here we walk down the road until we reach Manasi Ganga, which is a lake where Krishna made the Ganges appear, and which has a small township around it. There are several little holy spots to see here. So as we make our way around it we can see the places such as the Makharvinda Mandira which stands out along the waterfront on the southeastern corner of the lake. The Chakra Tirtha area on the eastern side of Manasi Ganga has the Shiva temple called the Chakalesvara Mahadeva Mandir. Across from that is one of the bhajana kutirs of Sanatana Gosvami and a small Mahaprabhu Mandir. On the western side of the Manasi Ganga, you can see the Manasi Devi Mandira and the Harideva Mandira is located up a few lanes. Your local guidebooks or maps, or traveling with someone who knows the area, will make finding these places easier. Or also asking the local people how to reach them as you walk along will also work. I’ve been to these places several times, but the first times I would go with someone else to show me the way. Walking further down the road, or through the small alleys from the Harideva Mandir, we next come to Govardhana town. We make our way to the Dana Gatt Giriraja Mandira, the temple where we pay our respects to Govardhana Hill because this is where He starts to actually become visible. The hill itself has been shrinking for hundreds of years, and the first part of the parikrama we really cannot see Him because of being underground. But now the hill becomes visible and we can see the rock formation. As we start this part of the parikrama, there is also a place that shows Radharani’s footprint. As we approach the southern end of Govardhana Hill, we arrive at Govinda Kund. This is a good place to rest for a few minutes. This kund was created when Indra, the king of heaven, performed the bathing ceremony for Lord Krishna. After Indra realized his mistake for harassing the people of Vraja with heavy rains that he had sent, he returned and performed a bathing ceremony for Lord Krishna in order to try and pacify the Lord and obtain His forgiveness. The accumulated water from the bathing ceremony gathered to form this kund. As we start again, there are other smaller temples and little kunds and forests along the way that we walk through. A person could actually spend several days just going to each holy place and hearing or reading about the pastimes that took place there. Finally, we reach Naval and Apsara Kundas, which are at the far end of Govardhana Hill and near the half-way point when we start heading back to the north along the other side of Govardhana Hill. Therein we continue through the small forests and past more small and occasional temples and kunds. Along with this part of the route, there is also a place called Aparadha Kund, which is a small pond just off the path where Indra atoned for his offense to Lord Krishna for having sent the torrential rains over Vraja. As we keep going, if we are with a group, someone will likely be guiding us to the most important places and will explain the meaning and history behind each one. Of course, we cannot slow down too much if we expect to get back in time to catch our return ride to Vrindavana. Finally, we reach Uddhava Kund and stop for a few minutes at the small temple here. The temple has Radha Krishna deities, believed to have been originally installed by Vrajanabha, Krishna’s grandson. A new set of Radha-Krishna deities has also been installed now which is famous for being formed out of one piece of marble. Behind the temple is the Uddhava Kund, the water of which is said to have originally come from the tears of Krishna’s queens when they were consoled by Uddhava at this place. Again, many of these places around Govardhana can be found with the help of special guidebooks and maps. But the easiest way is to come to Vrindavana for a visit during the month of Kartika (Oct-Nov). This is the time when devotees celebrate Govardhana Puja or the worship and respect of the sacred hill. Then you can easily go on one of the Govardhana parikramas when groups of devotees gather in buses to go to Govardhana Hill early in the morning and walk around the hill and stop to visit these particular holy places along the way. North of Govardhana is Barsana, 30 miles from Mathura, the town where Radharani grew up and the capital city of her father, King Vrishabanu. Once we arrive, we walk up the steps to get to the main temple of the town that looks like a fortress on the hilltop which can be seen from miles away. This is the Shriji or Larily Mandir, a local name for Radha. It is very ornate and the walls of the interior are covered with paintings of Krishna’s pastimes. Lovely Sri Sri Radha-Krishna deities are on the altar. A short walk away is the Radha-Kushal Behari Mandir, another majestic temple on a different peak of the hill, with Rajasthani style architecture. A little further away on another peak is the Mayur Kuti temple that has a painting of Krishna dancing as a peacock for Radha’s pleasure. The painting was done by a blind saint who had the divine vision of the pastime as long as he was working on the painting. On another of the hill’s peaks is Man Kutir, a temple marking where Krishna made Radharani angry for fun, but She left Him to lament and look for Her. Then the other gopis brought Them back together, much to their celebration. The four peaks of this hill represent the four heads of Brahma, and the hill is considered an expansion or incarnation of Lord Brahma. A few miles from Barsana is Nandagram, another place where Krishna performed many childhood pastimes described in the Bhagavatam. On top of the hill is the main temple that has deities of Krishna, Balarama, Nanda Maharaja (Krishna’s father), Mother Yashoda, Srimati Radharani, and two of Krishna’s friends. There is also a Shiva lingam in a small shrine across from the temple called Nandisvara, said to have been installed by Vajranabha many hundreds of years ago. It is considered that this hill is an incarnation of Lord Shiva. From the top of the walls that surround the temple, we can get good views of the area, and someone who is familiar with it can point out other nearby places connected with Krishna’s pastimes that we may want to visit. As I’ve said, this is by no means a complete description of Vrajamandala and the holy places within it, such as Vrindavana, Mathura, Govardhana, etc. And there are too many to mention for this discourse which covers all of India. However, there are already full-length tour books dedicated to doing this, which I recommend you to purchase. The significance and the history of Vrindavana is a full topic by itself. Nonetheless, this description of Vraja will certainly give you a start to finding the important places to see if you’re ever fortunate enough to visit. It is explained that all the holy places of India are manifest in some way in Vraja-mandala. Thus, Rupa Gosvami writes that anyone who leaves Vraja to go to other holy places achieves nothing but the trouble it takes to get there. Nonetheless, I will be describing many of the holy places throughout India anyway.